Those who are assigned as Approvers will see additional options in the Time and Expenses sections of My Insight. Time and Expense approvals follow the same process detailed below. Selecting Time Sheet Approvals will display a list of time sheets requiring approval. Be sure to note the start date and end date of this list as you may need to adjust it to see all time sheets requiring approval. As always, use the display icon to change the date range, hide previously approved entries, hide previously rejected time entries and for custom column selections. When using the Time Sheets by PM Only or Time Sheets by PM and Final Approver options (See "Time Entry & Time Sheet Settings"), the time sheets will continue to have a status of pending until ALL approvers have completed the process. PM's do need to approve their own Time Sheets if using a 1 or 2 Tier option. Once a range has been selected a list of pending time sheets will be shown. Selecting a time sheet (by clicking the data in the start or end date column) will expand the time sheet detail for review, approval or rejection. There are three options for Time Approval by Time Sheets. They are 1 - Tier Approver Only, 1 - Tier PM Only or 2 - Tier PM & Final Approver. Refer to Time Approval Work Flow to determine the preference for your organization. The time sheet allows for editing, adding and deleting time by the Approver. In the top right corner there are 5 icons displayed. Add Unsubmitted Time which can be used to add time that a resource has entered but has not been submitted. Note this time is shown in red within the Summary section as a warning. Cancel the Time Sheet. Note this would send the time back to the resource for submitting again. Adding comments for rejecting a Time Sheet. Details for the changes needed should be put in the comments and the reject option chosen. See also Time and Expense Rejection Process. Completely deleting the line of time entry. Note if you delete the line of time, it simply goes back to the resource as unsubmitted time, it is NOT deleted from Project Insight. Only the resource themselves can delete the time entry completely. This is done by going to the Time Entry Worksheet, selecting the appropriate Time Period and deleting the entry. 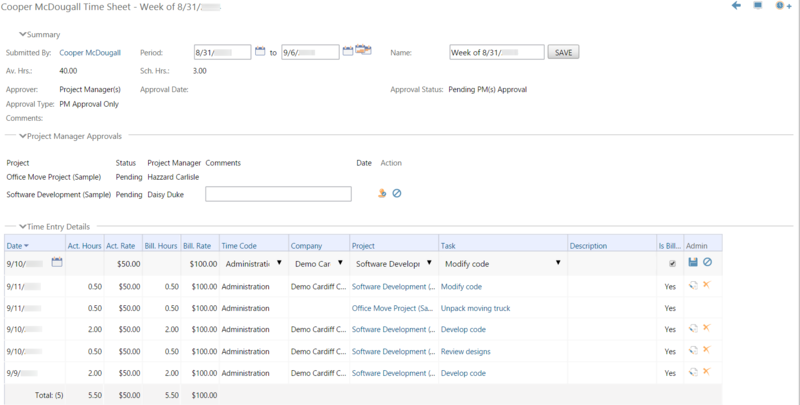 The time sheet allows for editing, adding and deleting time by each Project Manager. The example below shows Cooper's time sheet as viewed by Daisy, who is a PM. Approving or rejecting the Time Sheet. Each line represents a different project. In this example, Daisy is NOT the PM for the project called Office Move Project. Since she is NOT the PM for that project no icons are shown at the end of the line. Those icons would be shown for the PM of the Office Move Project. When using the 2 - Tier option, the PM's will continue to approve as noted above and then there is one additional step for the Final Approver. The example below shows Cooper's time sheet as viewed by Patti, who is the Final Approver. In the Project Manager Approvals section note that the Final Approver can only take 1 action, which is to reject the time. Rejecting the time would sent the time back to the resource for changes. In the Time Entry Details section not that the Final Approver can not take any actions other than adding a new line of time entry.